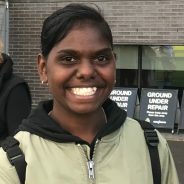 Mekala is our first student from the East Arnhem community of Ramingining. Mekala arrived in Geelong mid February 2018 and has come a long way from the quiet young lady she was when she arrived. Mekala is in Year 10 at Belmont High School and has been working hard in her EAL classes to improve her English. Mekala has also been playing good footy this season in the U/18 St. Joseph’s girls football team. It is Mekala’s goal to complete Year 12 here in Geelong and look to go on to further studies, possibly nursing. 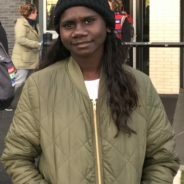 Justina, the younger sister of Evelyn, also from Galiwin’ku and attending Belmont High School, decided to make the journey down to Geelong and pursue her dreams of getting a good education and playing footy at the highest level possible. She had a great start to the year, playing and training with the Geelong Falcons as well as the U/18 St. Joseph’s girls footy team. Unfortunately in her first practice game of the season, she ruptured her ACL and required a full knee reconstruction. It was a tough start to her year down in Geelong, being so far from home and not being able to play any sport, however her resilience and strong mental toughness got her through. Justina had a knee reconstruction and we hope to see her back on the footy field in 12 months time. Justina hopes to complete 3 years of study down here in Geelong and graduate from Year 12, with the hope to go on to further studies. Evelyn is from the community of Galiwin’ku, also known as Elcho Island. Evelyn joined us at the beginning of 2018, commencing Year 11 at Belmont High School. Already she has displayed determination, committment to pursuing her education and football career and she is a true leader. Evelyn is a very talented footballer, signing a contract with the VFLW Geelong Cats team early in 2018 and making her debut in May 2018 against Collingwood. She played a number of games in the VFLW season, but also played with the Seniors at St. Joseph’s Football and Netball club. A memorable match in 2018 was against the NT Thunder VFLW team in Darwin. 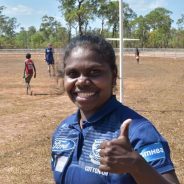 Evelyn flew with the Geelong Cats team to Darwin to play and then 8 of her team members made the trip to Galiwin’ku to visit her home community and meet her family. Definitely a great experience for Evelyn and her team mates. Evelyn’s goals are to complete Year 12 in Geelong and look to pursue further studies, possibly Sport and Recreation. Take a look at a highlights video of the trip to Galiwin’ku. Yirrmal Marika was part of the first group that started the leadership program in April 2011. He has had over 6 years of living in two worlds and returned in 2017 for another year of study. Yirrmal is proving to be a future leader of Arnhem Land and plays a very important role in the program now, not only is he continuing to further his own education but he is a mentor to each new participant that enters the program and he is a fantastic advocate of the program each time he returns to his homeland; he is always talking to young lads and to the elders about the Marrma’ Rom Two Worlds Foundation and the importance of education and learning to live in two worlds. During his time here Yirrmal successfully obtained a VCAL certificate after completing Years 11 and 12 at St. Joseph’s. In 2013 he decided to do another year of study at St. Joseph’s College; a Year 13 ‘gap’ program consisting of intensive English and Maths. He also completed a Certificate 3 in Music Business at Oxygen Music College during that period. 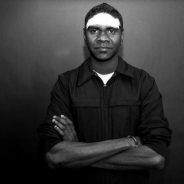 2014 was a big year for Yirrmal as he moved to Melbourne and studied a Certificate 4 in Music Business at North Melbourne Institute of Technology. This was a tough year for him truly living independently in Melbourne but a successful year in all aspects of his education and learning to live in two worlds. Yirrmal returned to Geelong in 2015 to study a Diploma of Music at Oxygen Music College. He is yet to complete all units of this course but plans to do so at some stage in the future. 2016 was another busy year for Yirrmal. Between his study and his emerging music career, Yirrmal was enthusiastic, extremely passionate and inspired by the positive people and mentors that surrounded him. In 2016 he studied a bridging course in English and Maths at Gordon TAFE in Geelong, and undertook some intensive tutoring in music theory. He successfully obtained his Certificate 1 in Adult Education – literacy and numeracy and commenced the Certificate 2 at the beginning of 2017. Yirrmal’s hardworking and dedicated attitude has allowed him to continue on his learning journey. He released his debut EP at the end of 2016 and has performed on some big stages amongst some amazing artists, but he remains humble, focused and fully committed to his education.